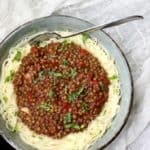 In this recipe for Lentil Marinara I make my favorite marinara sauce even healthier by adding peppery, delicious French lentils. There's no added oil here; instead, use vegetable broth for flavor and more healthfulness. A gluten-free, nut-free, soy-free and oil-free recipe. Wash the French lentils and place in a saucepan covered with at least two inches of water. Bring to a boil, cover, lower heat, and cook 20 minutes or until the lentils are tender. Drain and set aside. In a large saucepan, heat 2 tbsp of the vegetable stock. Add the garlic and saute, stirring frequently, until the water dries up and the garlic is fragrant. This should take no more than 2 minutes. Add the tomatoes with all the juices, red pepper flakes and oregano. Add the remaining one cup of vegetable stock and bring to a boil. Stir well and let the sauce cook for 15 minutes. The sauce should have patches of bright orange liquid on top. Stir in the cooked lentils. Season with salt and add ground black pepper if desired. Let the sauce cook another five minutes, stirring it a couple of times. Serve hot over a bed of pasta. Click here for a recipe for homemade vegetable stock. If you want to be completely oil-free, skip the step for sauteeing the veggies.